Download multiple files to a device and other related actions. The PhoneGap - Manifest ... (multiple actions) action makes it easy to download multiple files (including SQLite database files) to a device so that these files can be accessed while the application is offline. Fetches the files listed in a manifest and stores the files on the mobile device. Show the files on the device that were stored when the manifest was downloaded. Deletes all of the manifest files for a particular folder. Gets the base folder in the device's filesystem where the manifest files are stored. These actions are described in more detail (along with their properties) below. The Fetch files in a manifest action downloads one or more files at a location specified by a manifest. The manifest can be defined at design time as a JSON array or downloaded from a URL. The Manifest type defines how the manifest is provided. It can either be a static JSON array that defines the files to download or a URL where the manifest can be found. The URL where the file can be downloaded. The file type. This can be "sqlite", "folder", or "file". The location to save the file on the mobile device's filesystem. This property does not apply to SQLite files, which are always stored in a special location using the Manifest folder name and three underscores as a prefix on the SQLite database file. For example, folder___db1.db. If type is set to "folder", the folder must be zipped into a single file. If you are downloading SQLite database files, it is recommended that these files are zipped to minimize the amount of data to download. If the Manifest type is set to "URL", you must specify the URL where the manifest can be found. The manifest must use the same JSON array format as the one used for the Manifest JSON property above. The name of the manifest folder to save the files on the device. Defines where in the file system the manifest should be downloaded. 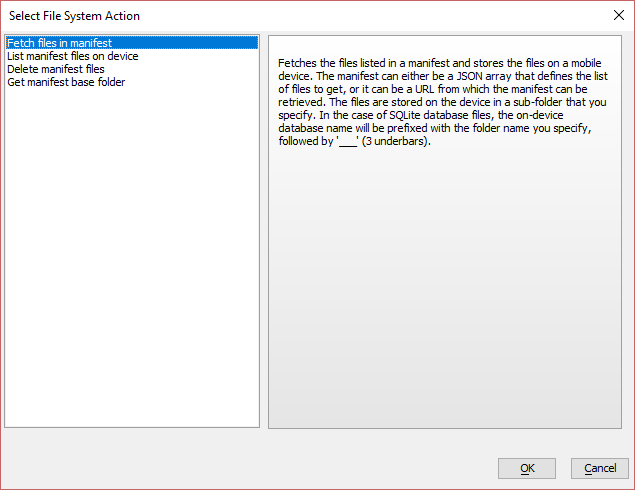 The File system part can be "temp", "private", "saved", "public", or "persistent". true/false indicating if the manifest was downloaded. If error is true, it does not mean that every file in the manifest was downloaded. The information about whether an individual file listed in the manifest was downloaded is in the obj.array property. an array of objects. Each object has the name of a manifest file and other information indicating if the file was successfully downloaded. The name of the manifest folder where the files were saved on the device.